Federal prosecutors have many tools to fight crime in their toolbox and one of their favorites to use is the federal statute that prohibits a previously convicted felon from possessing a firearm. The potential penalty is a sentence of up to 10 years in prison. In the the typical case, state law enforcement officers will arrest a suspect for some relatively minor offense, often a misdemeanor or gross misdemeanor such as a DUI, or a minor felony such as possession of a small quantity of marijuana, and while searching the suspect, they find a firearm. When they subsequently check the suspect’s prior record, they discover a prior felony conviction. Question: Now what do they do? Answer: They contact the feds and turn the case over to them. Because a federal felon-in-possession-of-a-firearm charge is a far more serious offense resulting in a much longer sentence than would be imposed in state court if the suspect were convicted. Usually the difference is many years versus a few months. Felon in possession charges are also very easy to prove and most defendants plead guilty. Oops, not so in North Carolina anymore. Because North Carolina switched to a “structured” sentencing format in 1993 in which the maximum sentence for any given offense is based on the crime of conviction and the person’s prior record. Under this system, the maximum sentence that may be imposed on a person committing a relatively minor offense that previously could have resulted in a prison sentence (i.e., more than a year incarceration), is now capped at less than a year. Why is this change significant? A prior felony is defined by federal law as a criminal offense for which the maximum sentence that can be imposed exceeds one year incarceration. This means that people convicted in North Carolina since 1993 of offenses that previously qualified as minor felonies (i.e., potentially punishable by a sentence of more than a year incarceration) have been convicted of offenses that no longer qualify as felonies under federal law, if the maximum potential sentence is less than one year. 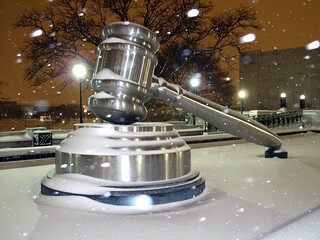 Despite the change in the law in 1993 reducing the maximum potential penalties for many minor felonies to less than one year incarceration (i.e., changing the offenses to non-felonies under federal law), the state continued to refer and the feds continued to accept and prosecute cases charging people with felon in possession of a firearm where the prior felony conviction was no longer technically a felony conviction under federal law. On August 17, 2011 when the Fourth Circuit Court of Appeals decided United States v. Simmons. Since that time, federal prosecutors in the three federal districts in North Carolina have stopped prosecuting cases where the prior conviction no longer constitutes a felony due to the 1993 change in North Carolina law. They also dismissed any cases in that category that were still pending on direct appeal. What about everybody else who either did not appeal their conviction because they pled guilty not believing they had a valid legal issue, or they exhausted their appeal before Simmons was decided last year? Tsk, tsk. Sorry old chap. Too bad. So sad. No can do. Yep. The United States Attorney in each of the three federal districts in North Carolina conceded the defendants in those cases are innocent, but they say they have no remedy except to file a writ of habeas corpus and habeas corpus is limited to raising issues of constitutional law. Innocence does not count, they say. How many people are affected by this error? Nobody knows, including many people convicted under the federal statute. Federal public defenders in the three districts are searching their files. USA TODAY conducted a similar, though far more limited review, examining every gun conviction in western North Carolina between 2005 and 2011. The review was limited to people who had been convicted only of gun possession, and included only those cases in which federal prosecutors had specifically identified the prior offense that made possession a crime. USA TODAY used state court records to find those cases in which the men’s prior convictions were, in hindsight, not serious enough to convict them of the federal crime. This is a no-brainer. Congress absolutely must pass a law that permits innocence to be raised as a separate issue on direct appeal and in post-conviction habeas petitions without any time-limit restriction within which the petition must be filed and, if it does not do so, the Supreme Court must create the remedy. Please take a few minutes to read the USA Today story, particularly the stories of some of the people affected by this mess. You are currently browsing the archives for the Felon in Possession of a Firearm category.